It is typical that the first time i ever manage to fall asleep when flying – mainly because i was traveling business class (very lucky) oh, and the cocktails before helped – I am hit with the finest experience jet-lag had to offer. The only benefit to being awake when everyone else is fast asleep is that I experienced the best Bangkok had to offer in the short 24 hours I was spending in the city, before heading down to Koh Samui. Let me show you what I got up to in Bangkok in just 24 hours…. Bangkok blew all my expectations away. The opinions from most of the people I spoke to before I left were totally wrong. The city itself is massive – being one of the biggest arrival points into SE Asia you can understand why – when stepping off the plane I was expecting – from what others told me – a frenzied, unorganised rush to a taxi. What I found was exactly the opposite. Speeding along the freeway to the beautiful Anantara Riverside. Staring out the passenger window and admiring the sheer size of the city I found myself in, spotting landmarks I had read about and beautiful towering hotels pushing ever higher to offer the best rooftop views. I was almost disappointed at how modern this city was. So what do you do when you arrive into Bangkok and slightly Jet-lagged? When I say I slept the whole flight, I mean the WHOLE flight. I even missed dinner (what?!). So arriving into Bangkok food was on our mind. Lucky for us after enjoying another cocktail (obviously), taking the complimentary boat cruise across the river and into a – awesome – TukTuk we were heading for the much talked about, Anantara Sathorn ZOOM Sky Bar and Restaurant. Food with a view is definitely the way to go. 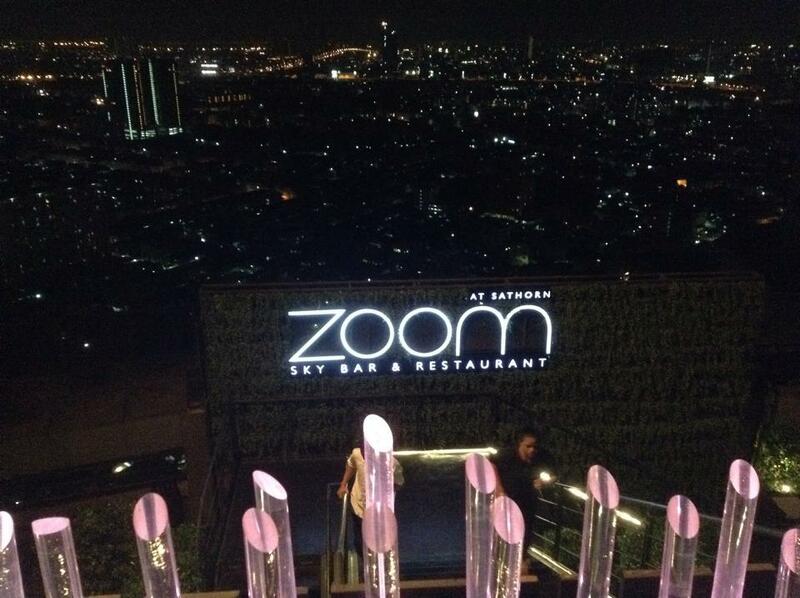 The restaurant is stylish with different levels (all outside) offering spectacular panoramic views of the city. The centre of the restaurant doubles up as a bar and has a small dance floor. The DJ is there all night playing stylish mixes of popular songs, attracting you to the dance floor after numerous cocktails, lack of sleep and the need to work off the delicious dinner (and desert). After dining in style, head to the famous backpacker street, Khao San Road, trust me. Not just for backpackers, this road is filled with bars offering live music – although sometimes it seems more of a contest on who can make the most noise, not always good. – awesome street food I.e. scorpion on the stick – always a good snack, right? – good Thai food and lined with numerous shops selling everything from Selfie sticks to elephant pants. This truly is a tourist hot spot but also brilliant for people watching. So if you’re not ready for the night to end after your rooftop dinner, still suffering from insomnia thanks to jet lag get down here – on a tuktuk – and enjoy! Seize the morning, there’s so much to explore! I only had 24hrs! Get up at a decent time, brush off the hangover and get out there and explore! The morning is a great time to explore, the heat is not yet at its peak, it’s the perfect time of day to explore Bangkok before you have to leave. Booking excursions is a great way to maximise what you can see in the small window of time you have given yourself, without the worry of missing flights and getting lost on the way to airports. Bangkok Klong Canal Tour on a Long Tail Boat, of course! 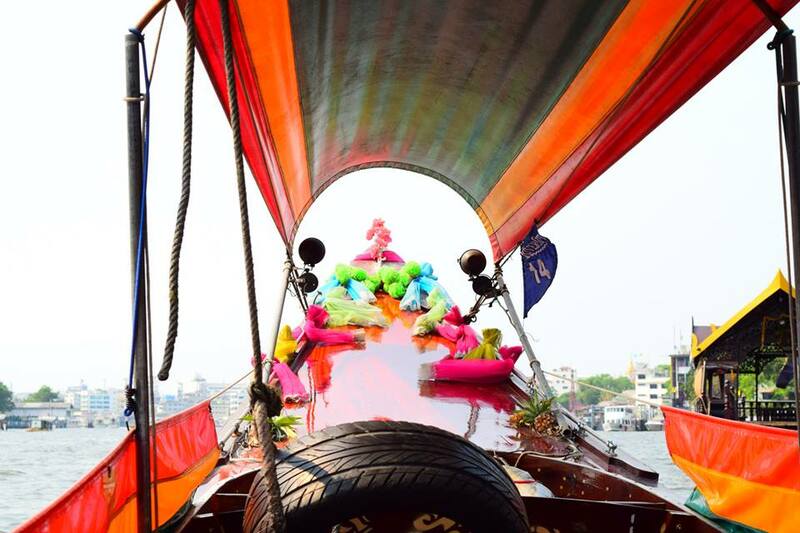 What better way to experience the old vs new Bangkok than to hop on one of the beautiful long tail boats and weave your way around the city, take a trip back in time and view what Bangkok was like before the Skyscrapers became the cities view points. Be prepared to have your eyes opened to the ‘way of life’ for many local people. 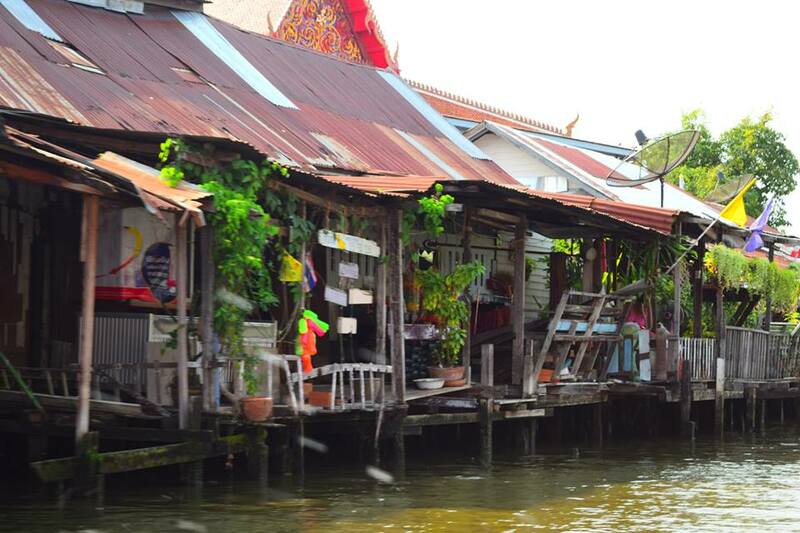 They live on the side of the Canals in the rotting, collapsing, basic housing that is still standing. Washing clothes in the polluted river water and trying to make a living, often, from selling you trinkets from their dug out kayaks. Then turn a corner and you will lay eyes on some of the most beautiful Golden Temples, Shrines, The Grand Palace, and much more. Turn another corner and experience the tranquil surroundings of shrubbery and greens. Get lost in daydreams. Top Tip: Do this trip in the morning (late morning at a push) you do not want to be caught on a long tail boat, in the midday heat. It’s hot! Hop off at Wat Arun, the temple of dawn on the Chao Praya River and test those legs. One of the most beautiful temples on the banks of the Canal. 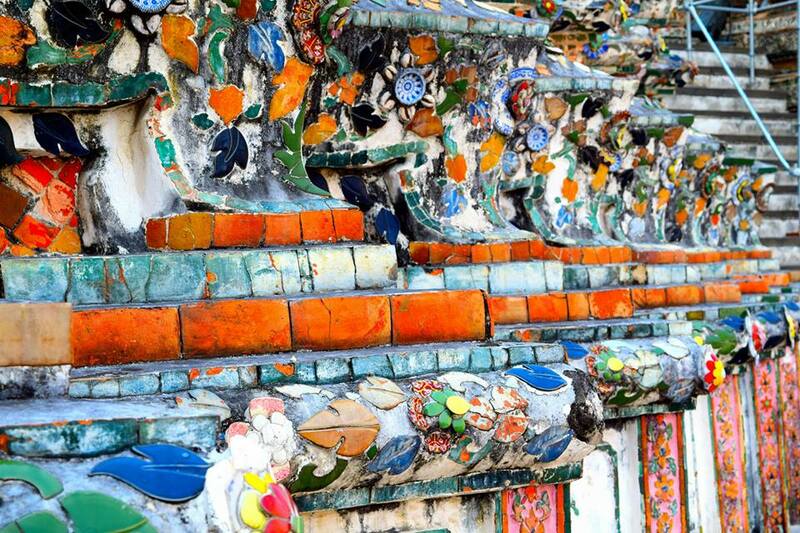 If you do take the trip with a tour company you will be accompanied by a guide to Wat Arun. The guides are awesome and really give you the information you need to fully appreciate this beautiful mosaic creation. The temple is beautifully deceiving, offering what seem like simple stairs up to higher view points offering views over the cities rooftops, but testing your legs each time. One missed step and you (and your precious camera) are sliding down a level and not in a fun way! Sadly, this temple is currently undergoing renovation works – I seem to be annoyingly unlucky with this happening – which are essential to keeping the temple, well, open and beautiful. You are able to climb to the top of the temple, unfortunately this was closed when I visited due to the construction (which is supposed to finish the end of 2016 wah!). The steep climb is accessible to one person at a time and it’s tough – from what I’ve been told – but offers spectacular views from the top. Time to work off those cocktails! Let’s do one more temple, i promise you want to fit this one in! Wat Pho or the temple of the reclining Buddha. This beautiful temple is located just behind the Temple of the Emerald Buddha (okay so maybe fit two more in?) and is a must see for first time travellers to Bangkok. Because it is one of the biggest temples in the city and famous (of course) for its HUGE reclining buddha covered in beautiful Golf Leaf. There is more here than just the reclining buddha, make sure and explore the rest of the huge grounds once you are done puzzling over how they managed to fit such a huge statue into such a small place. Wat Pho has also got one of the leading schools of massage situated in the grounds – so you know you’re in good hands, haha!, sorry couldn’t resist! – and it is also where one of the first public universities in Thailand was founded. Important Tip: Upon visiting temples make sure you are dressed appropriately and act respectfully. As much as these beautiful temples and shrines are tourist attractions they are in regular use by the locals for prayers, offerings and religious respect and importance. Don’t be one of those people asked to leave a temple…. that’s a bit embarrassing. This is what I managed to get up to in 24hrs (in amongst work commitments) I’m sure there are more things you could pack in and enjoy but why over do it? I can’t wait to head back and explore the city more. Until next time Bangkok! If you only had one day in Bangkok, what would you get up to? Khao San Road is our fave spot in the city Janey. We love it there. 3 dollar lunch for 2, $5 massages and 90 cent banana shakes, and fab quality across the board. This place is paradise to us. So much flavor too. Never any shortage of anything in BKK or at KSR. Thanks so much for sharing your experience with us. I just had one night in Bangkok with Mrs Wilbur. We did Sky Bar at Lebura Hotel, Golden Palace, Reclining Buddha. The palace was wonderful but too busy, the bar pretentious but the Wat Pho fabulous. I also had 24 hours there a few years ago before catching the train to Laos. That time we did Jim Thompson House and just got lost on the rivers and canals – fabulous! Fantastic! I head back to Thailand in a month and I will have a lot of time to explore Bangkok! How was Jim Thompson’s house? I hope you get there and experience Thailand it’s an amazing country!